I love this outfit from an advertising shot from Armine. I don't normally pair purple, pink and brown together, but it looks quite good in this photo. I've used a tunic in my set, but if you're looking for a coat, the Cocoon coat from Oasis would be perfect. I've also found a less expensive eşarp option, though you can buy the exact one from Hijab Planet for £35.04. Click here to see exactly how to tie it Turkish style. 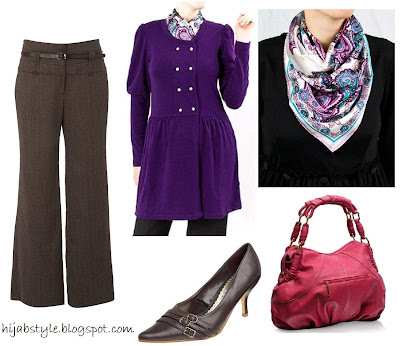 Purple Knitted Tunic £30, LOSVE; chocolate wideleg trousers £22, Dorothy Perkins; Purple Paisley Square Silk Scarf £25, LOSVE; Bessie bag £30, ASOS; chocolate triple buckle court shoes £15, Debenhams. great color combo, love the look you put together! Ooohhhhh the tunic is sooooo perfect (I like it better than the coat). why dont they have cloths like this in the U.S.?????? Anon 1, 2, Sally, thanks! Anon 3, I bet they do, you just need to look hard enough!